AUTHENTIC! BEWARE OF COUNTERFEITS! Made in the USA! Suaoki Portable Stainless Steel Fish Lip Grabber Gripper Grip Tool Fishing Gear with Weight Scale and Max 33 lbs / 15kg Capacity. Don’t worry about how to handle fish ever again. Suaoki’s Stainless Fish Lip Grip will help you hold fish without hurting or dirtying yourself from the fish or from the hook. Strong corrosion resistant 304 stainless steel fish gripper jaw, great fishing gear for fresh water fishing and saltwater fishing, comfortable soft foam grip. Stainless Steel Portable Fish Grip Fishing Lip Grip Holder Gripper Weight Scale & Ruler. Rapala RFFG6B Floating 6" Fish Gripper. Make fast work of landing and releasing your catch without harm to you or the fish. Securely hold fish with one-hand. Built from durable, molded heavy-duty plastic for ultimate corrosion resistance. MADE IN HIGH STAINLESS STEEL. 5" Stainless Steel Fishing Pliers Scissor. Safety Latch In the middle of the pliers. Compact size and Easy to carry in the Tackle Box. Made of High Quality Titanium Alloy, Lightweight and Toughness. 01 PIECE. New Stainless Steel 5.5" SPLIT RING PLIER WITH GREEN & BLACK PVC. MADE IN HIGH STAINLESS STEEL. Keep the fishing gripper vertically and then long press the power key to turn on the gripper. - For use in both fresh and salt water. Fits in your tackle box. 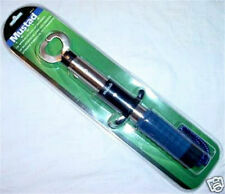 - Stainless steel fish grabber jaws firmly grip fish. High grade stainless steel, Ergonomic Design, Multi-function design, with a Spring Lanyard and a black nylon sheath. It is designed in such way that to prevent your hand from unnecessary fatigue. Wash out salt and dirt on the surface area of the pliers by water. Hunting & Tactical. Punch Mitts, Thai Pads & Shields. Extracts with minimal harm to your catch. Kid's Clothing & Shoes. Lanyard included. Spring-loaded trigger handle. Removes embedded hooks safely. Sure-grip jaw action. | Listing is for a pair of spring loaded Mustad 5" Ultra Strong German Steel Split Ring Pliers | Model KVD-717sc - | Our new Sportman's Tools combine legendary Mustad craftsmanship and dependability with rugged style. Ergonomically designed for enhanced comfort and ease of use. All tools feature a quality fit and finish any angler can appreciate. The result is a comprehensive lineup of durable tools in today's most popular styles. Each is affordably priced and each is worthy of being called Mustad - the world's best-selling hook brand. The assortment consists of heavy-duty forceps, aluminium flashlights, fish scales, line clippers, various pliers and trace cutters. Pliers and trace cutters are in polished,corrosion-resistant stainless steel finish. |. 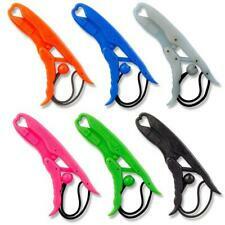 This Grippers are a valuable fish grabber tool for all fresh and saltwater anglers. Strong corrosion resistant 304 stainless steel fish gripper jaw, great fishing gear for fresh water fishing and saltwater fishing, comfortable soft foam grip. Manufacturer's Part Number: RMSP. Rapala Mini Split Ring Pliers make it a snap to change out or replace hooks. Simply put, we are outdoor enthusiasts who happen to have a warehouse full of top quality gear - the selection that makes it easy for you to get what you want. 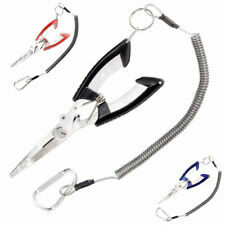 Fish Lip Grabber Gripper Stainless Steel Grip Plier Fishing Portable Tool 15KG. Suaoki Portable Stainless Steel Fish Lip Grabber Gripper Grip Tool Fishing Gear with Weight Scale and Max 33 lbs / 15kg Capacity. Saltwater Fishing. Aluminum Fishing Pliers Long Straight Jaws. Fishing Reels. Fishing Tools. Fly Fishing. Fishing Tools & Accessories. Fishing Rods. Fishing Lines. 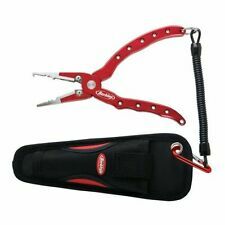 Fishing Pliers Fishing Gripper 1 x Fishing Gripper. Can be used to take the hook, raise the fish, cut lines, broken wire, broken hooks, pressure bite lead, folder lines. Clamp head curved mouth design, easy to replace the fishing hook. 1 pc of remover only,other accessories demo in the picture are not included! Great for fishing enthusiasts. Application: Hook: within 8.4mm. Material: Stainless Steel. Line: within 0.5mm. It is a wonderful tool for removing hooks without hurting your hands. Rapala Stainless Steel Pliers - 6-1/2"
Rapala lure tuning tool. Special features not found in other pliers. Stainless steel construction resists rust for years of service. Hand lanyard. Split shot crimper. Split ring tool. Soft grip handles. 4.5 out of 5 stars - Rapala Stainless Steel Pliers - 6-1/2"
7 product ratings7 product ratings - Rapala Stainless Steel Pliers - 6-1/2"
Easily hold your fish safely and comfortably with our amazing "Fish Lifter!". Made from durable injection molded plastic for a long life. There is also a hole molded into the base of the "Fish Lifter" so you can install your own rope or lanyard. Line Cutterz fishing line cutting ring. Adjustable/trim to fit. Punch Mitts, Thai Pads & Shields. Designed to quickly and efficiently remove deep set hooks from your catch. Includes a lanyard. Stainless steel construction. Soft grip handles for secure, no-slip grip. 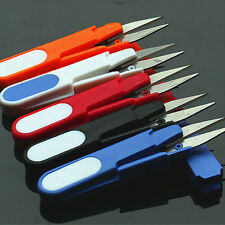 Multifunctional fishing pliers is made of stainless steel, lightweight and comfortable to use. 1 x Fishing Pliers. Item Weight: 59g / 2.08oz. Color: blue. 1 Piece, New Stainless Steel 5.5" Split Ring Plier with GREEN & BLACK PVC Handle High Quality. Shimano Split Ring Pliers Model ATBP0045 Length: 4.5 inches Black nickel and High-grade carbon steel. The new finish adds protection from corrosion, custom 2-tone rubber grip Shimano screen logo on both handles . Stainless Steel Portable Fish Grip Fishing Lip Grip Holder Gripper Weight Scale & Ruler. Strong corrosion resistant 304 stainless steel fish gripper jaw, great fishing gear for fresh water fishing and saltwater fishing, comfortable soft foam grip. 1 X Fishing Split Ring Pliers. 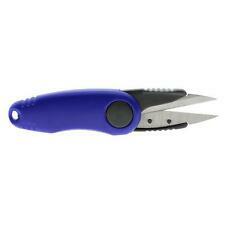 Ideal for cutting hooks, rings and fishing wires;. Net weight: about 50g. Material: stainless steel. Made of stainless steel;. If item is defective after 3 months, you can still send it back to us. Mustad MT028 Braid Cutter/Split Ring Pliers 5"
Braid Cutter/Split Ring Pliers 5". Tackle Boxes. Ice Fishing. John B Outdoors looks forward to serving you. Check-Out Now! What happens after I have paid for my item?. We are located in Stuart Florida. Ideal for removing hooks or tying flies. Corrosion resistant stainless steel. Durable construction. Water Sports. Water Bottles. Phone Accessories. Travel Accessories. Instructional DVDs & Books. Rapala Floating Fish Gripper Land and Release Your Catch Without Harm to You or the Fish Quick Release Mechanism Corrosion Resistant Includes Wrist Lanyard Overall Length: 6". PRECISE CANADA ---Mini Split Ring Pliers 5"
1 Pcs Mini Split Ring Pliers 5". PRECISE CANADA. QUANTITY: 1 PIECE. Credit Card Over The Phone. Material: Premium Grade Stainless Steel. CARE FOR YOUR LIFE AND HEALTH.